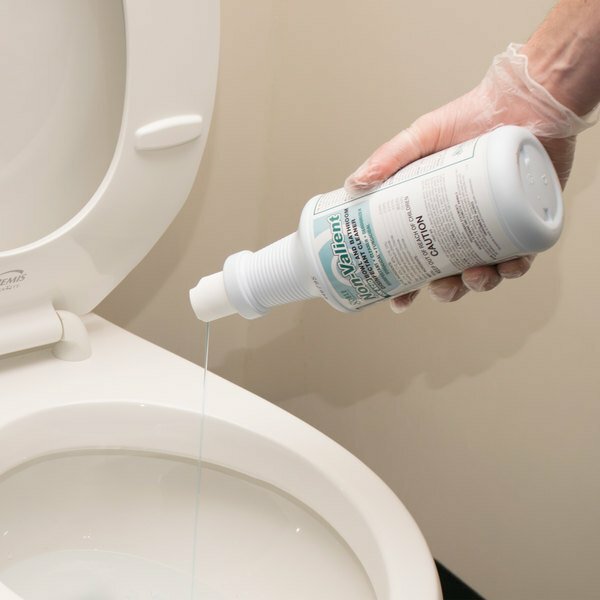 Maintaining a clean restroom goes a long way in ensuring customer satisfaction, and this Noble Chemical Non-Valient, Non-Acid toilet bowl and restroom cleaner is perfect for completing this unpleasant task. The special formula effectively kills odor-causing germs and inhibits the growth of mold and mildew on toilet bowls, urinals, sink basins, tubs, tiles, walls, tabletops, and other non-porous surfaces. Customers will take note of your clean restroom when you use this cleaner. One of the best bowl cleaners you can get for this price. Some of the other cheap ones are got we’re really watery. This one is thicker and cleans well. Noble chemical 32 oz non valient non acid toilet bowel cleaner and restroom cleaner/disinfectant is the only toilet cleaner we use. Much cheaper than Sysco and GFS. Great quality. It does its job, but I wouldn't use it for anything but the inside of the toilet bowl. It's pretty thick and we usually spray and wipe sinks and counters. This of course can't be sprayed and is really thick. It's good if you want something you can buy in bulk. GREAT VALUE ON CLEANERS. Works great on tough jobs, no complaints from any staff and much easier to get a case at a time instead of using box stores. This toliet bowl cleaner is very reasonably priced compared to other products. Non acid makes okay for everyday use and fragrance keeps urinals and toliets smelling fresh everyday. Its very difficult to find a non-acidic cleaner or one that doesn't contain harsh chemicals that should not be breathed in. This one is perfect as you can use and let it sit in the toilet for extra cleaning power and not worry about it damaging any parts of the toilet. It cleans really well. While the disinfectant capabilities are impressive, the cleaning ability of the product did not impress me in the least. It did not seem to remove stains any better than an organic cleaner that I had tried, and certainly left a much stronger chemical smell. I may use it as a bathroom disinfectant, but I will stick with standard acid based toilet cleaners to remove tough stains in the future. 1 Qt. (32 oz.) Noble Chemical Non-Valient Non-Acid Toilet Bowl & Restroom Cleaner works ok, wish bottle came with nozzle, but you can always pick those up, not a bad item. Purchased this as a replacement for the toilet bowl cleaner we were obtaining through a local cleaning supply company. This cleaner is more efficient and more economical. It is also more versatile than the previous product, saving us money on purchasing a second higher price chemical as well. What a bargain. The Noble Toilet Bowl & Restroom Cleaner gets the job done, and leaves you with a clean toilet. It does have a fairly strong smell, but its that clean disinfected smell - a good thing. A toilet bowl cleaner that you can trust and believe in. Its non-abrasive and easy to rim the edges with the non-acidic liquid and allow it to work. A great cleaner for the cost! Non-acid toilet bowl cleaner! No worries in damage to your toilet bowls and it gets the job done. Simply put it in your toilet bowl and let sit for a min then wipe or scrub it down easily. Getting rid of those stains! 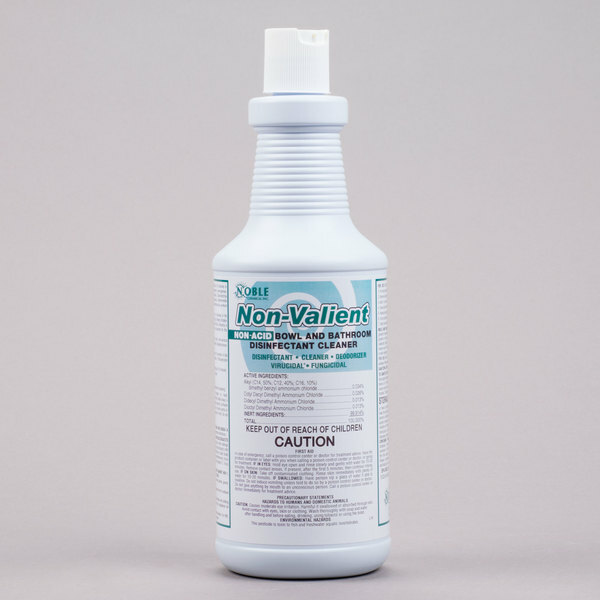 This one quart of Noble Chemical Non-Valient Non-Acidic Toilet Bowl and Restroom Cleaner was quite strong but very good at removing old stains in the base of the toilet. I actually diluted it and left it on several stains for a few hours and it made scrubbing very easy. I would highly recommend this for any cleaner. Effective toilet bowl cleaner that gets the job done. Leaves toilets clean without a harsh smell. Would only improve by having a nozzle that gets up under the rim. I've been using the same toilet bowl cleaner for awhile now, and while it's fine, I thought I'd try something new. This works quickly and doesn't take a lot of effort. This is my first time using this product and it is exactly what I was needing. It is very easy to use and has a nice, and not overpowering, fragrance to it. I absolutely love this product! This toilet bowl and restroom cleaner works great! It does have a strong scent though! Great on stains and cleans germs. I used this product today and I couldn't believe the results it gave me! This product very much surprised me, and you get it for a great deal! Must Buy!!! I wish this were a bit more intense. It has a hard time keeping up with tough calcium build up but we love it anyway. WHOA! that's a clean toilet bowl and urinal!!! the Nobel chemical non-valiant non acid toilet Bowl and restroom cleaner makes quick work of a task nobody wants to perform. The 1 QT. Noble Chemical Non Acid Tolit Bowl & Restroom Cleanr ssold 12 per case. It is great for killing germs like eccoli,and ect. It also kills odors from mold and mildew as well as removes it.